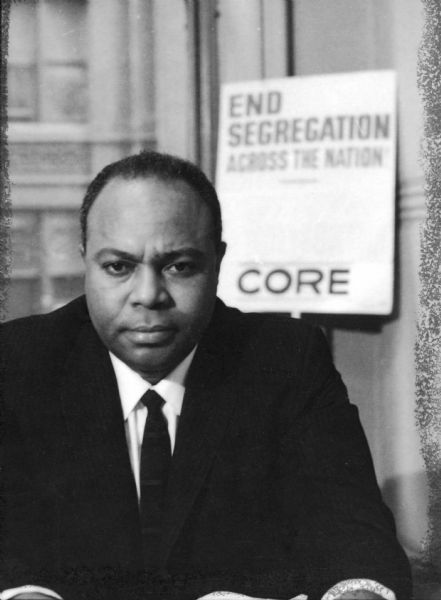 Portrait of James L. Farmer, Jr. sitting at his desk with a "End Segregation - CORE" poster behind him. James Leonard Farmer, Jr. was a civil rights activist and leader of the American Civil Rights Movement. He co-founded the Committee of Racial Equality in 1942, which later became the Congress of Racial Equality (CORE). He was also the initiator and organizer of the 1961 Freedom Ride, which eventually led to the desegregation of inter-state transportation in the United States.